Guess what! I got a new sewing machine! OMGGGG. My previous machine (which I'm holding onto in case of emergency, or in case friends want to come over and sew with me, pleaseeeeee) was a Baby Lock Grace, purchased in 2011 after I quit my first tech job and took a few months off to mentally recover. 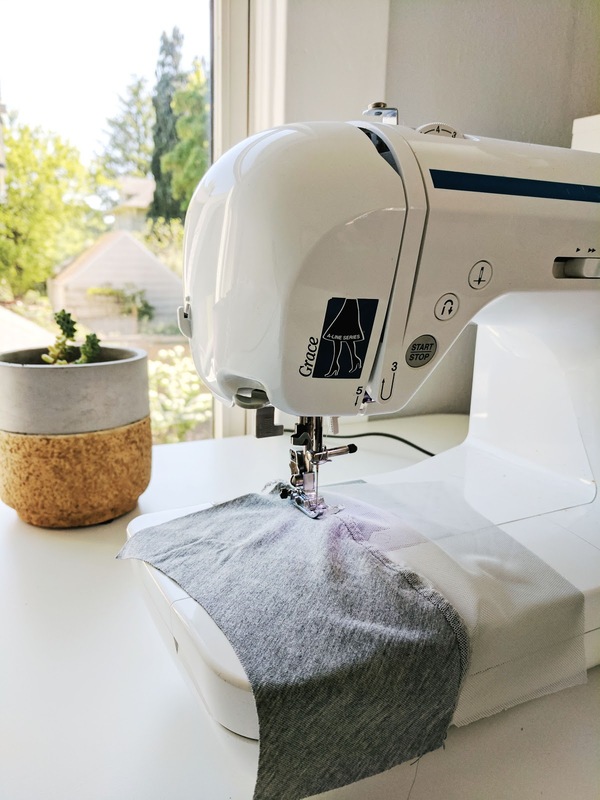 I pulled it out about once a year to mend or sew something small and otherwise never touched it—until 2015 when I started learning to sew clothing. It's a perfectly okay machine, and it's held up like a champ through the last two years of nonstop sewing. I'd say durability and ease of use are its strong points; precise or tricky sewing, not so much. I knew I wanted to upgrade eventually now that I'm spending approximately all of my time at my machine. A couple of months ago I asked my instagram friends about what made a higher end machine worth it to them, and I got lots of great answers that convinced me upgrading would be worth it... at some point. 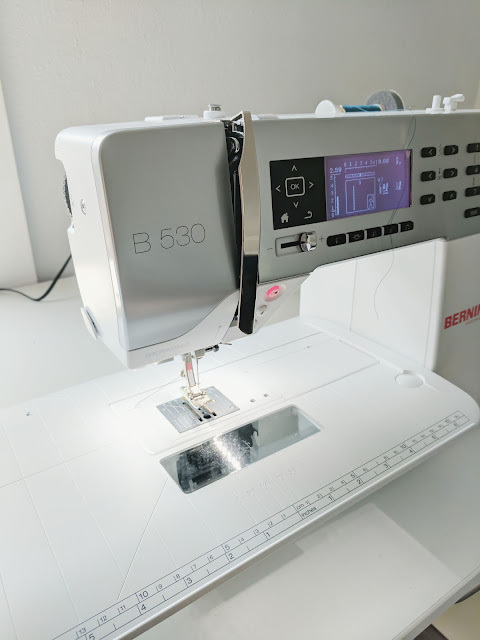 Bernina seemed to be the clear winning brand in terms of popularity and quality across the board (with prices to go with it - oof), but I had a few responders swear by other machines that I'm sure are also great! My friend Liz let me borrow her mechanical Bernina for a few weeks (thank you Liz! ), and it was a great experience. 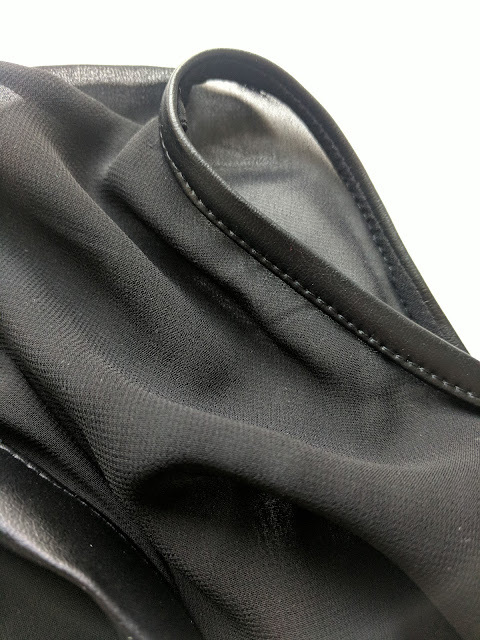 The stitch quality was amazing compared to my Baby Lock, but I missed some of the features of my computerized machine (auto button holes! auto needle down! ), so I knew I wanted to invest in a computerized machine rather than a mechanical one. But I kept putting the purchase off, partially because I hate making choices like this, and also because we're still recovering from moving/settling in expenses and I didn't want to spend money until I had to. Then a couple of weeks ago I sewed a pair of jean shorts, and the topstitching went super poorly - my machine just had trouble with the layers of denim and topstitching thread, and I had to rip out and redo my stitching so many times to get it looking good. It was an ordeal. About a week later I started sewing a self-drafted top that combines chiffon with pleather, and I realized that I just couldn't make it into something I was proud of using the machine I had on hand. So Tim suggested we go to my local Bernina dealer, and I picked one out that day (basically an "impulse buy" that I'd been thinking about and planning for for many, many months). I honestly resisted this purchase for awhile, not just because of money, but because I was worried about using my machine as an excuse for not sewing as well as I could. There's that saying about how good photography is about the photographer, not the camera, and I think that also applies to sewing to an extenet. I didn't want to buy a fancy machine and let it make up for my shortcomings. I'm honestly really happy with the balance I struck here. For the two and a half years since I really started sewing, I've been constantly improving. The mini collection I sewed earlier this summer was honestly the first time I remember sewing anything and not feeling like I could have done a better job by the end. Which isn't to say I'm done learning, but that I at least have a couple of creations that I'm more or less happy with now :) But the jorts and the chiffon top stood out to me. I would stop, seam rip, and redo the parts that didn't go well, but I was becoming more aware that the things that went wrong were less about my sewing skill and more about my machine's limitations. Instead of just improving my skills when I redid the tricky parts, I was figuring out how to make things work despite my machine's limitations. This was a turning point for me - what could I produce if I didn't have that limiting factor? 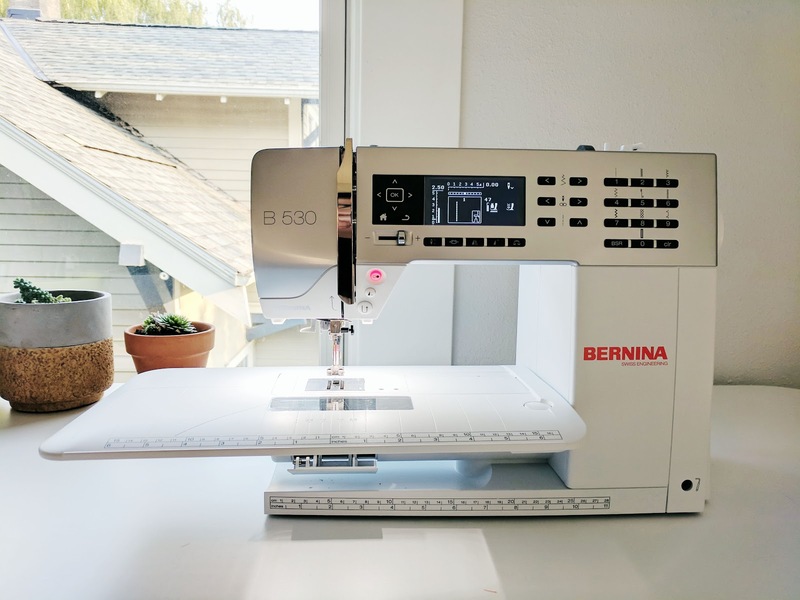 I ended up getting the Bernina 530, which is around mid range as Berninas go. I also got a few extra feet that should help me out a ton with trickier fabrics (walking foot, omg!). I considered a nicer one in the 500-series, but it was significantly more money for things like a touchscreen and auto thread snipping, and it just wasn't worth the extra expense. I plan to use this machine for many, many years, and to make garments that I sell, so I definitely thought about whether it made sense to invest in an even nicer machine than this one. But I really think a fancier model would have made my life ever so slightly easier without really improving my output much, and I'm okay with this trade off. I've been sewing with my Bernina for a week now, and yes it is just as fantastic as you might expect! 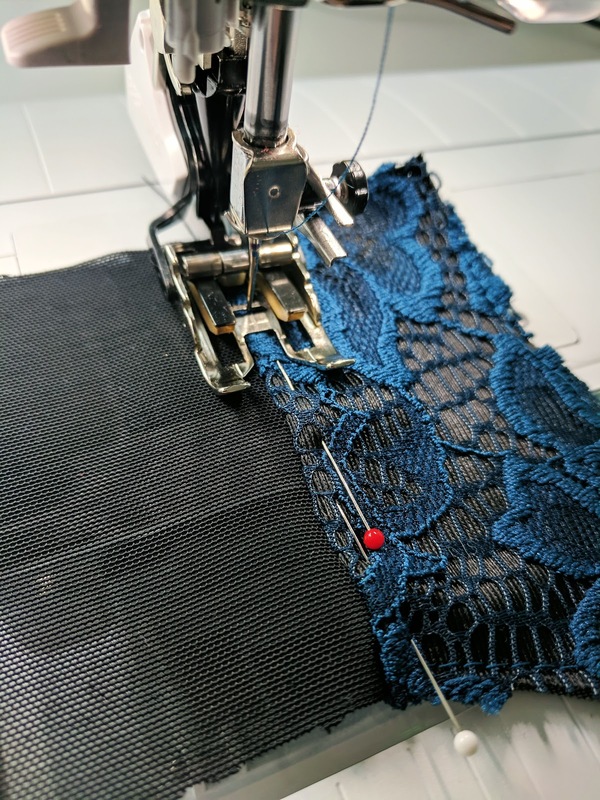 I broke it in with the aforemorementioned chiffon top and then with a lacy, self-drafted bra, and the new machine made all of the fiddly parts go so much easier. Everything is smoother, the walking foot (something I had never purchased for my old machine) is AMAZING on trickier fabrics, and I finished the chiffon/pleather shirt and am super happy with it! The shirt honestly came together way better than I ever imagined it would. I actually have two fiddly silk projects and one in a very drapey rayon in the pipeline, and they are going to be a joy to sew compared to my old machine. Sewing is so much more fun now!